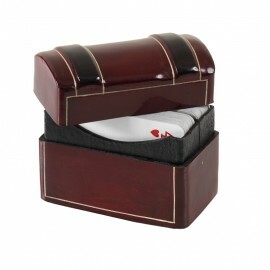 Jewellery case bordeaux leather printed croco or brown leather, cm 40x29x 26,5. Realizable in all leather colors. Desk set leather printed reptile, composed of 3 pieces: desk pad (cm 68,5x49x2), paperknife and letter holder with clock. 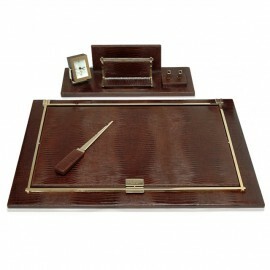 Desk set 6 ps “right linear”, as traditionally produced in Florence, made in a wooden structure covered in vegetable tanned leather, painted and decorated by hand. Finished in moirè. Available in all our colours. 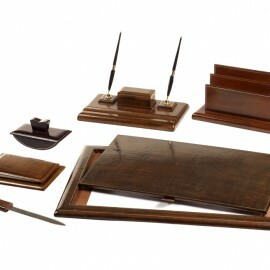 The set consist of: writing pad, paper holder, ink stand, paper knife, note book, blotting pad. Brown ostrich leather, cm 25x25x 26,5. 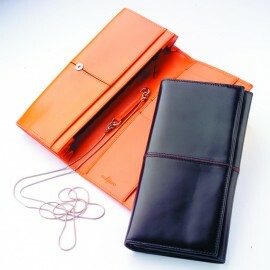 Realizable in all leather colours. 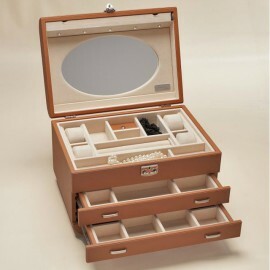 Jewellery case Ivory leather, cm 34x25x20. Realizable in all leather colors. Brown reptile printed leather, cm 37 x 30,5 x 9. 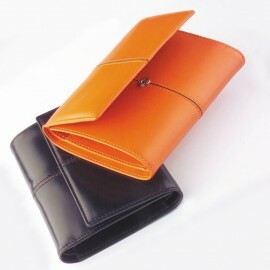 Realizable in all leather colours. 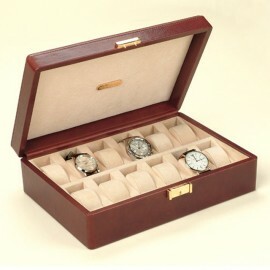 Watches case in brown, or light brown, leather coloured by hand, cm 30,5×21,5×9,5. 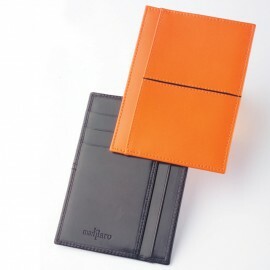 Avaliable in all leather colours. 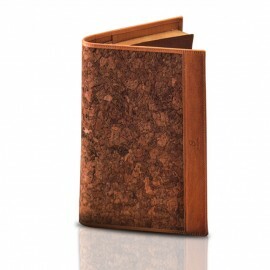 Cork-Leather Folder with A4 Map , cm 30×23, cover in kidskin and cork-leather, big internal pochet, pen holder leather ring, N° 5 pieces available. 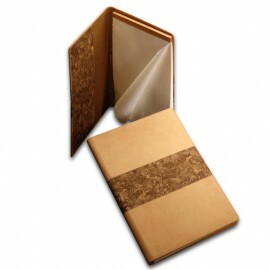 Cork-Leather Address Book Holder with Pad A5, cm.23×17, cover in kidskin and cork-leather, pen holder leather ring, N° 4 models available. 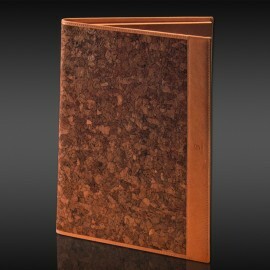 Cork-Leather Diary, cm.23×16, cover in kidskin and cork-leather, internal pocket N° 3 models available. 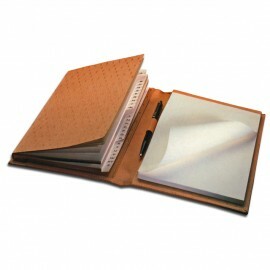 Cork-Leather Folder with A4 Pad, cm 30×23, cover in calfleather and cork-leather, big internal pochet, pen holder leather ring, N° 7 models available. 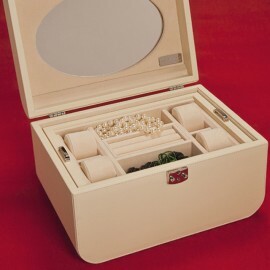 Large jewellery case, cm. 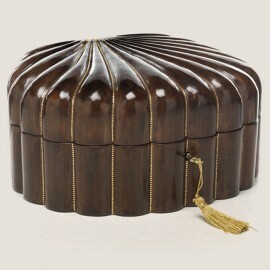 24 x 18 x 9,5, made in a wooden covered in vegetable tanned leather only by hand, painted and polished. 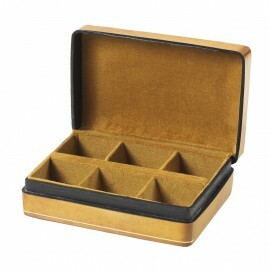 Available in all our colours, inside finished in velvet lined, with the elegant tray to take off with ring-stand. Lock with key. 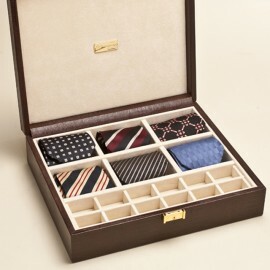 Cuff-links case, cm 13x8x3, made in vegetable tanned leather only by hand, painted and polished. 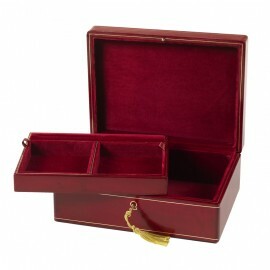 Finished inside in velvet, with 6 partition for ear ring or cuff-lins. Painted and polished by hand. Available in all our colours. 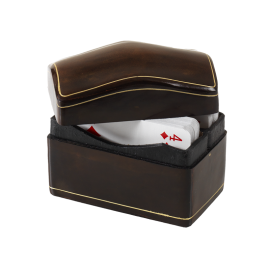 Playing cards cm. 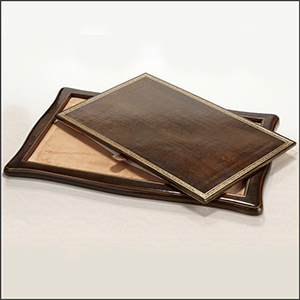 6×10,5×8, made in wood covered by vegetable tanned leather, with the reliefs on the top. Painted and polished by hand. Available in all our colours. Playing cards holder Louis style cm. 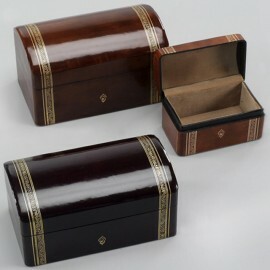 11×6,5×8,5, made in wood covered by vegetable tanned leather. Painted and polished by hand. Available in all our colours. "Must of Italy" offers luxury Made in Italy products, in the interior furnishing sector, household items, gift items: leather, ceramic, porcelain, silver, gold filigree, crystal and glass, furniture, bronze sculptures. Some of these articles are unique, exclusive, unavailable or difficult to find.